Hi, my name is Grayson Hawkins, and I started Your fabulous Reusable Straw Company. How did I figure out about the importance of reusable straws? My Aunt Heather, who is a sea lion trainer at the Houston Zoo, sent me my very own straws last summer! The environment provides us food, it provides us water, it provides us everything we need to live in life, but if we start harming animals with plastic straws it may not be able to give us what we need to live- like food and all that kind of stuff. Sea lions and other marine animals are being injured and even killed by straws in the water. 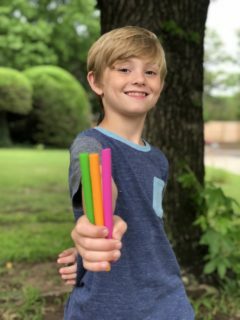 A full year after sending my nephews silicone straws, Grayson, now seven-years-old is taking action to help others become Ocean Heroes. He started his own reusable straw business with a portion of the proceeds being donated to save marine wildlife! 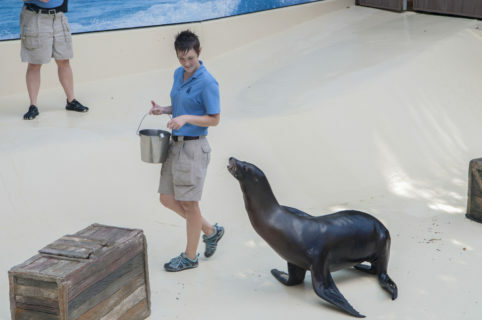 As a Senior Keeper in the Sea Lion Department, I care for our resident California sea lions who serve as ambassadors for their wild counterparts. Working closely with this amazing species has given me the opportunity to learn a great deal about how marine debris threatens their ocean habitats and the homes of many other aquatic animals. Finding a way to reduce these threats has become a passion for me and for the other keepers on my team – so much so that 4 years ago we came together to create a monthly clean-up at Surfside Jetty where Zoo staff members join us in collecting as much debris as possible from this popular fishing spot. Of course, my love for our oceans and the animals that live in it has led to me making changes in my personal life as well, cutting back on my use of plastic items and eliminating things like single-use plastic straws from my daily routine as much as possible. Perhaps one of my favorite parts of my plastic-free journey has been sharing the experience with my two nephews Grayson and Jack. If you guys are reading this, please pitch in and help encourage restaurants to stop using single use plastic straws. They might say yes to paper straws or silicone, or stainless steel. Please buy reusable straws. You can buy it from my company; you can buy it from someone else’s company, just get some to replace single use plastic straws. Thank you! 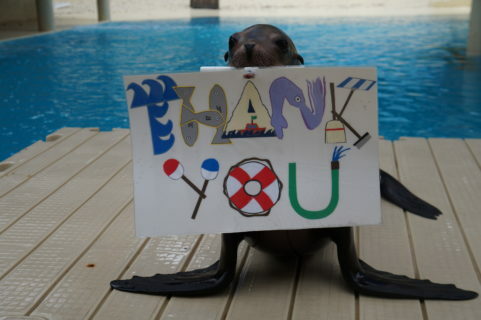 When you visit the Houston Zoo, come by to see me and the sea lions! You never know how your trip to the Zoo might inspire you to become an Ocean Hero too!